Trying harder doesn't always improve relationships or bring promotion. But choosing to live with honor will strengthen relationships, bring elevation, build bridges, and deepen our worship of and intimacy with God. The blessing of honor is seen throughout Scripture, as those who remained honorable flourished, and those who did not suffered from tragedies, wars, and hardships. This book explains that when we honor family members, authority figures, the overlooked, colleagues, subordinates, and the like simply because they are God's creation, we honor God. And honoring God is an act of worship that leads to a deeper intimacy with Him. While some self-improvement and leadership books address the importance of respect, few explain the life-changing power of honor. Through biblical examples and personal stories, this book will help readers grow closer in their relationship with Jesus and truly appreciate the people around them as they learn to create a culture of honor in their lives, families, and ministries. 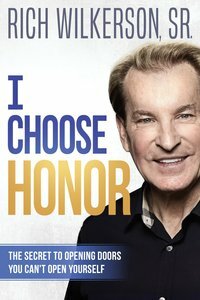 About "I Choose Honor: The Secret to Opening Doors You Can't Open Yourself"
:When you honor the people that others hate, you honor God. The blessing of honor is seen throughout Scripture, as those who remained honorable flourished, and those who did not suffered from tragedies, wars, and hardships. This book explains that when we honor family members, authority figures, the overlooked, colleagues, subordinates, and the like simply because they are God's creation, we honor God. And honoring God is an act of worship that leads to a deeper intimacy with Him. While some self-improvement and leadership books address the importance of respect, few explain the life-changing power of honor. Through biblical examples and personal stories, this book will help readers grow closer in their relationship with Jesus and truly appreciate the people around them as they learn to create a culture of honor in their lives, families, and ministries. Rich Wilkerson is a pastor, evangelist and author. He is regularly featured on national television and is pastor of Trinity Church, in the heart of Miami, Florida's inner city.